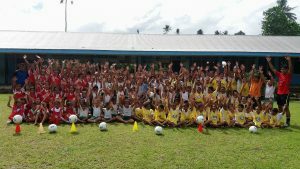 ‘Sports to Life Programme’ which is a three day course for College teachers around Upolu and Savaii was launched by Football Federation Samoa (FFS) through the Just Play Programme this morning. The Course is an Introduction to the ‘Sports to Life Programme’ which targets children in the age group of 13 – 16 years old. This isn’t the first time the Course has been introduced in Samoa, FFS President Laupama Solomona officially opened the launch and delivered the keynote address. Following the keynote address, Just Play Project Manager, Lynette Laumea Fa’aiuaso presented on the overview and importance of the Course. “Today’s event is a combined course for teachers from Government, Church and Private schools, Mrs Faaiuaso said.” Sport to Life is a programme that uses social methods and tools to educate children from 13 to 16 years old to develop football skills and encourage them in a mentoring setting with decision making and discipline on and off-the field. Additional to participation of the local teachers, Just Play local partners namely Nuanua ole Alofa, Ministry of Police, Ministry of Health, National Advocacy Organization of People with Disabilities are also joining the Programme to ensure that teachers and a wider sector of the community are able to access the Programme for development purposes. The Programme for the three day Course starts today, Wednesday 7th March 2018 until Friday here in Upolu and will be held in Savaii on Monday 12th March to Wednesday 14th March at the FFS Regional Technical Centre. Sports to Life (S2L) are a unique sports based coaching curriculum developed by UNIFEC in Nambia that interprets the delivery of learning outcomes from within the sporting context. Sport 2 Life helps coaches from any sports code to facilitate positive outcomes by helping players to develop the skills to make consistent, long-term, healthy lifestyle choices on and off the field of play. 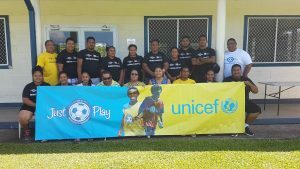 Modifications to the Sport 2 Life curriculum have been made by UNICEF Pacific and the Oceania Football Confederation to contextualize the curriculum for use by the Oceania Football Confederation’s Just Play 13-16 year programme. Building on the success of the Just Play 6-12 year programme, UNICEF supported the OFC to develop a 13-16 year programme model. Working alongside secondary schools the Just Play 13-16 year programme links concepts of the Just Play 6-12 year programme, progressing with children throughout their primary and secondary school years. With support of an existing sport for development platform titled, Sport 2 Life, originally developed by UNICEF Namibia, the newly created Just Play 13-16 year programme merges concepts of Just Play and Sport 2 Life, forming a coherent platform to support the on-going sporting education of children. Just Play is a sport for social development programme designed to target children aged 6-12 years and providing an environment where children learn, grow and explore football in a positive and meaningful way. Delivered by teachers, in primary schools (during school hours), and by community volunteers (after school hours), the programme engages children through active participation in an organised series of interactive football sessions. Through the integration of social messages into all sessions and activities, children learn to develop healthy lifestyle habits, include persons with disabilities, support and encourage gender equality and increase their school and community engagement. 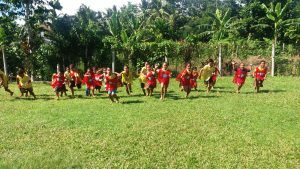 Developed and managed by the Oceania Football Confederation, with support from the Australian Government, the Football Federation of Australia, the New Zealand Government, UNICEF and the Union of European Football Association (through the UEFA Foundation for Children), the program has reached 251,850 children across 11 Pacific Island countries. Next PostOne door closes, another one opens.